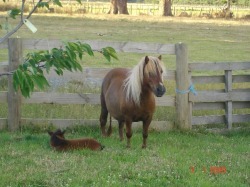 Kim's Sire "Ramaal Nathan" is the one and only National Champion to win Supreme Miniature Pony Exhibit in all of these places; Perth WA, Adelaide SA, Melbourne (twice) Vic, Canberra ACT (twice), Brisbane QLD and Sydney NSW. Pretty impressive! Palomino filly "Indiana Of Featherstream"
Buckskin filly "Esprit Of Featherstream"
2009 bay colt "Half Pints Elusive Dreams"
2010 chestnut colt "Half Pints Spectacular Dreamer"
2012 brown colt "Half Pints Hot n Spicy"